Site three miles east. Border fort and port of entry into the United States while the 31st parallel was the southern border. Aaron Burr was held prisoner here after capture near McIntosh in 1807. This marker is on Old Military Road near Highway 43. Col. Ephraim Kirby was appointed additional judge of the Superior Court of Miss. Territory April 6, 1804, by President Jefferson. He took station at Ft. Stoddert and presided over the first superior court held in what is now alabama until his death. Col. Ephraim Kirby beginning at Bunker Hill fought in 17 battles and was wounded 13 times during the Revolutionary War. Entered the army as an enlisted man and was discharged as Lt. Col. of the Connecticutt Militia. Col. Kirby's grave is in the Ft. Stoddert Cemetery 2 1/2 miles east of this monument. 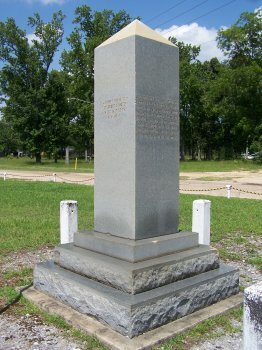 This monument is on Old Military Road near Highway 43. Mount Vernon has deep roots in Alabama’s rich soil of history. Before Alabama became a State in 1819, Mount Vernon was already a bustling little village. 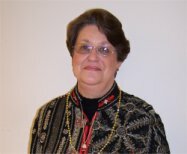 Her onset came from 2 military installations, Fort Stoddert and Mount Vernon Arsenal. Fort Stoddert was built July 1799 on orders from President Thomas Jefferson and Congress after the “Pinckney Treaty” was signed with Spain in 1795 over disputed land between the 31st and 32nd parallel. This formed the southern boundary of the United States. The settlers in the area were defenseless, isolated, and unprotected from open attacks by Indians on three sides and Spain in the south. Settlers whose names were Stiggins, Bates, Chestang, Weeks, Ballard, Andry, Linder, Johnston, and Hollinger are just a few. Under mighty oaks laced with moss, a one bastion fort was constructed on Ward’s Bluff (now called David Lake) by the 2nd United States Infantry commanded by Lieutenant John McClary. The location was on the Mobile River (now old river bed) near the confluence of the Alabama and Tombeckby Rivers. The fort named after Secretary of War Benjamin Stoddert. After completion of the fort, the command was under Capt. Bartholomew Shamburger with two companies. 1800 to 1811 Fort Stoddert was a port of entry, residence of the U.S. Collector of Customs, the capture of Aaron Burr, and the first newspaper, “The Mobile Centinel,” published by Samuel Miller and John Hood. Subscriptions were only $4.00 a year. The Commander was Lt. E.P. Gaines. The territorial judge was Ephraim Kirby, he died shortly after and Judge Harry Toulmin succeeded him. In 1811, Mount Vernon Cantonment was laid out by Col. Thomas Cushing. It was 3 miles west of the river known as Mount Vernon Springs which was on a magnificent hill. It was in the high country back from Fort Stoddert. A sickness known as “Yellow Fever” was prevalent along the river. Cushing thought higher ground would be a better location for the troops. General Claiborne made Fort Stoddert his headquarters and the Cantonment had upwards of 700 men because of the Creek War. 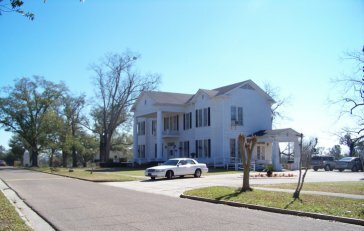 Andrew Jackson, the 7th President, visited the area and the troops were under the command of Major Uriah Blue in 1814. Col. Jackson was interested in Mount Vernon as an arsenal. 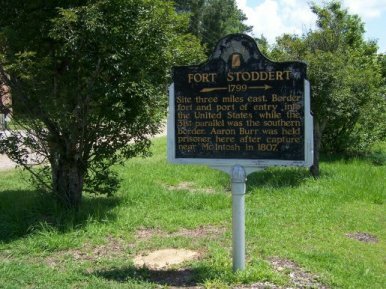 From 1818 to 1828, the Federal Road was constructed from Milledgeville, Ga. To Fort Stoddert, Ala. Blacks and whites alike constructed the road. 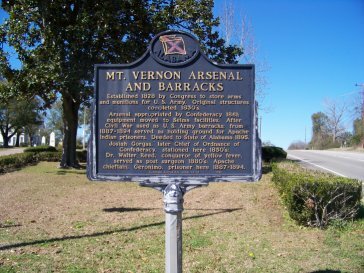 May 24, 1828, Mount Vernon Arsenal was authorized by an Act of Congress and signed by President Andrew Jackson. Edward Harding was the commander of Mount Vernon Arsenal. Construction on buildings and the wall around the Arsenal began about 1830. The Arsenal manufactured small weapons. From 1830 to1866 famous men known in American History were stationed there, Lt. Josiah Gorgas, Capt. John Cooper, and Capt. Jesse Reno who surrendered the arsenal to Confederate forces during the Civil War. At the close of the war the arsenal was returned to the Federal Government. 2 companies. These consisted of the Infantry, Artillery, and Calvary. In 1887, 450 Apache Indians were housed at Mount Vernon Barracks. Among them were famous men: Chief Chihuahua, Chief Natchez (son of Cochise), and Geronimo. It is said that Geronimo was the one who kept the peace among the Apaches. The occupation of the Apaches ended in 1894 when the War Dept. transferred them to Fort Sill, Oklahoma. In 1895, Mt. 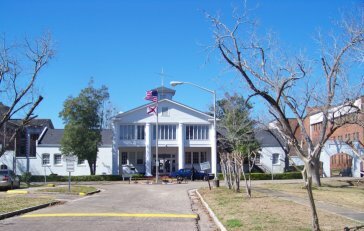 Vernon Barracks was released by the Federal Government and given to the State of Alabama. In 1900 the Alabama State Legislature approved the site as a mental institution known as Searcy Hospital. It is still being used for the same purpose today. Mount Vernon is a wonderful town, a gracious place to raise children without fear, and a place we call home. "Mount Vernon Alabama" and you will find the many articles listed below. "Indians at Mt. Vernon, Ala."
"Reservation Rev. Jas. C. Kerr Chaplain"
"Surgeon's Home at Mt. Vernon Insane Hospital"
"Geronimo, Chief of Apache Indians"